A record-setting rainfall that caused massive flooding has triggered the US President Barack Obama to sign a disaster declaration for areas in Texas affected by severe weather that killed at least 24 people and prompted mass evacuations. Barack Obama's federal aid, signed late on Friday, makes federal funding available to sufferers in Harris, Hays, and Van Zandt counties in Texas to rebuild their communities' damaged infrastructure and homes. Other counties could be reportedly added to the request later. The National Weather Service said that there's a 70-percent chance of heavy rain and thunderstorms in the Houston area from Saturday afternoon into Sunday. City spokeswoman Sana Syed has posted a map on Twitter of the most vulnerable areas in Dallas. According to the National Weather Service, some areas of North Texas saw up to seven inches (17.8 cm) of rain on Friday, with hundreds of residents calling for help. One Dallas-area police officer had to be plucked to safety by a helicopter after his SUV got trapped in rushing floodwaters. One person was found dead in Dallas' eastern suburb, Mesquite, after his pickup truck was submerged in floodwaters, TV station WFAA reported. The victim has not been identified. On Friday, authorities identified the body of a 6-year-old boy who was in a vacation home in Wimberley that was swept away by rushing waters. The home was knocked off its foundation and carried down the swollen Blanco River. The boy's mother and his 4-year-old sister are still missing. 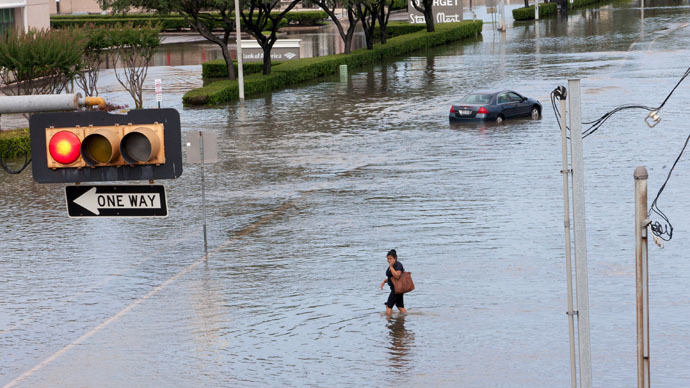 Thousands of cars were trapped for as long as six hours on a suburban freeway near Dallas on Friday, blocked by floodwaters. The Red Cross distributed cookies and water to stranded motorists, and opened a shelter for area residents impacted by the flood in Grand Prairie, a suburb of Dallas. "I feel like I am on an island and nobody cares," Vanessa Paterson, who was on the highway with her 6-month-old son, told TV station WFAA. Authorities have identified five of the six bodies found in Hays County. Six people are still listed as missing there, according to AP. "Communities across the State of Texas have experienced devastating destruction, injury and - most tragically - loss of life due to the major and unceasing severe weather system that has been impacting our state for weeks," Governor Greg Abbott, who has declared 70 counties disaster areas, stated. Rivers and lakes around Houston, San Antonio and Dallas have swelled, and meteorologists are predicting more rain this weekend. In the worst case scenario the Colorado River at Wharton, Texas, could crest on Saturday, causing major flooding in the community 60 miles (about 100 km) southwest of Houston. No estimate has yet been provided for the damage in Texas, which boasts an economy worth $1.4 trillion a year. Dallas officials advised people to go home early, promising: "This would be a great night to stay home, watch a movie and cook some popcorn," Dallas Police Deputy Chief Scott Walton told a news conference, Reuters reported. The mayor of Wharton has issued an evacuation order for up to 900 people living near the Colorado River, which started flooding into the city earlier this week. The city of Rosenberg also ordered about 150 residents living near the Brazos River to evacuate by late Friday, AP reported. Authorities said residents would not be allowed to return to their homes until the affected area is declared safe.